BEIRUT (AP) — An al-Qaida linked group claimed responsibility on Saturday for a suicide car bombing last week in a Shiite-dominated neighborhood in Lebanon, as its fighters fought other rebels in neighboring Syria in the most serious infighting since the uprising began. It was the first time at the al-Qaida linked Islamic State of Iraq and the Levant claimed responsibility for an attack in Lebanon, underscoring how the ever more complex Syrian war is increasingly spilling over into its smaller neighbor. The group may have rushed to claim responsibility to try to divert attention from the infighting in Syria, said Aymenn al-Tamimi, an expert on the country's militant groups. 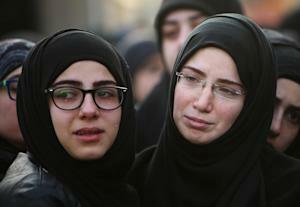 At least five people were killed in the Thursday attack that targeted a south Beirut neighborhood that is bastion of support for the Shiite group Hezbollah. It was "the first small payment of a heavy account which these criminal hypocrites should wait for," it said in a statement, referring to Hezbollah. The statement was posted on a website used by Sunni militants. The al-Qaida group sought to punish Hezbollah — and their ordinary Shiite Lebanese backers — for sending fighters to Syria to shore up forces of the Syrian president Bashar Assad, who is trying to quell an armed uprising against his rule. The bombing was the latest in a wave of attacks to hit Lebanon in recent months. The violence has targeted both Sunni and Shiite neighborhoods, further stoking sectarian tensions that are already running high as each community in Lebanon lines up with its brethren in Syria on opposing sides of the war. It also reflected how Lebanese are turning on each other. On Saturday, Lebanese authorities confirmed the identity of the suicide bomber, the state news agency reported. Local media identified him as a Lebanese citizen from a northern border town with Syria. 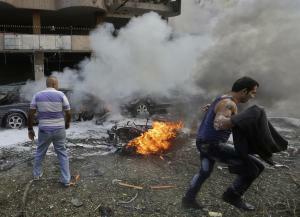 Thursday's bombing came a week after a car bombing in Beirut killed prominent Sunni politician Mohammed Chatah. 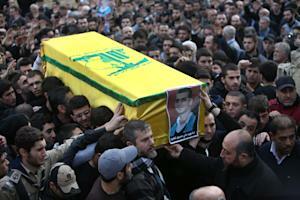 The top aide to ex-Prime Minister Saad Hariri was critical of Assad and his Hezbollah allies. 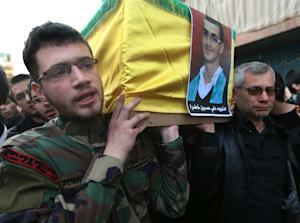 In November, suicide bombers targeted the Iranian Embassy in Beirut, killing over 20 people. Iran is the chief patron of Hezbollah and an ally of Syria, and the Islamic Republic's embassy is located in an upscale Shiite district. The tensions in Lebanon reflect the increasingly sectarian nature of the Syrian war, where hardline Sunni rebels dominating rebel groups have shown little tolerance for Syria's patchwork of minorities. In response, Syrian minorities have rallied behind Assad or remained neutral, fearing for their future should Sunni extremists come to power. ISIL is one of the strongest rebel groups in Syria. It emerged from the Sunni heartland of neighboring Iraq, where it has also targeted Shiites with car bombs, sending the country to the brink of civil war. 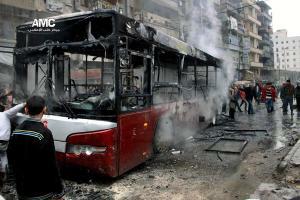 Its fighters have fanned into Syria, taking advantage of the upheaval to assert power in areas seized by rebels. It has imposed its strict version of Islamic law, kidnapped and killed journalists, Syrian anti-Assad activists and others critical of their rule. Tensions between ISIL and other rebel brigades have simmered for months. They erupted Friday after residents in rebel-held areas came out to demonstrate against the al-Qaida linked group, accusing them of killing a man who was trying to mediate between the groups, said the U.K.-based al-Tamimi, who closely follows Syrian militant groups. Fighting between ISIL and other anti-Assad rebel groups quickly spread through the northern province of Aleppo, the northeast province of Idlib and parts of the central province of Hama, said the Syrian Observatory for Human Rights. The Britain-based group said it believed tens of fighters had been killed. By Saturday evening, the ISIL said in a video it would withdraw fighters from strategic strongholds that have defended rebel-held parts of the northern city of Aleppo against Assad forces if rebel attacks against it continued. "They have stabbed us in the back and turned people against us," intoned a voice over the black-and-white symbol of ISIL on a video uploaded onto YouTube. The footage corresponded with The Associated Press' reporting of events. "We ask the people of Aleppo to take this seriously, because any withdrawal of ISIL from any of these areas means that liberated Aleppo will be assaulted." In other rebel-held parts of Syria, ISIL fighters cooperate with rebel brigades, said al-Tamimi. He said it wasn't clear if the fighting would spread, and noted that the rebels fighting ISIL belonged to rival brigades, with little to unite them, save for their hatred of the al-Qaida group. Still, the fighting had embarrassed the group, he said. He said it was likely they claimed responsibility for Thursday's bombing to try to refocus attention on their achievements: punishing Hezbollah and Shiites. "It's more of a public relations thing," he said. "Like — we have been able to strike Lebanon, we are the leading force." The Western-backed coalition of Syrian opposition groups in exile welcomed the attacks on ISIL. Monzer Akbik of the Syrian National Opposition group described the group as "the enemy of the revolution and an enemy of the people," and called on the international community to support moderate fighters against the Assad regime.